Learn why any organization relying on the IT ecosystem enabled by the Internet Protocol - especially those organizations with public-facing content - are at great risk. Why a lack of a business continuity plan, means business agility, and competitive advantage are all endangered. Learn how many IPv6 adoption goals are actually low-risk, low-cost and how numerous organizations are already making significant progress. Learn a step by step methodology that can help organizations overcome inertia and get started with IPv6 adoption. 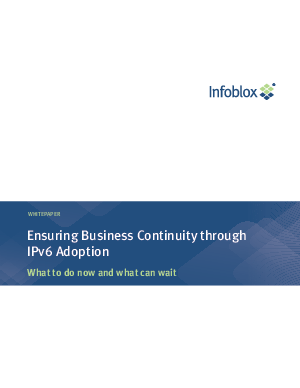 See how network automation simplifies an organizations adoption of IPv6.